Today I'm excited to let you know that the Order Selection Period for One Little Word® products and registration for the 2019 One Little Word® Workshop will begin tomorrow, Wednesday, November 28th at 9am Pacific. Links will be active after that time. Today's post is a preview of what you'll find available tomorrow. One Little Word® custom products are now available. In addition to acrylic words and necklaces (including a new style that allows you to add multiple word charms to a chain) we are also offering custom digital words. You can order a custom digital word here. For our main shop collection this year we are trying something new and using a box-ordering system/Order Selection Period along the lines of what we used this year for December Daily®. The Order Selection Period will open tomorrow (Wednesday, November 28th at 9am Pacific) and will close on December 14th with shipping to begin the week after. Shipping this year will happen just about a week later than last year. We are aware of the challenges for many of our international customers and will be getting these products on their way to you as soon as we can. One Little Word® products will be broken down into three categories during this Order Selection Period. Each category will have their own tab across the top of your browser window: My Box, Albums + Kit, Stamps + Embellishments, and Paper + Lifestyle. My Box: This is where your products will appear after you have checked out using the box in the top right. Albums + Kit: Includes albums, kit, and transparencies. Stamps + Embellishments: Includes chipboard, stamps, stickers, rubber, etc. 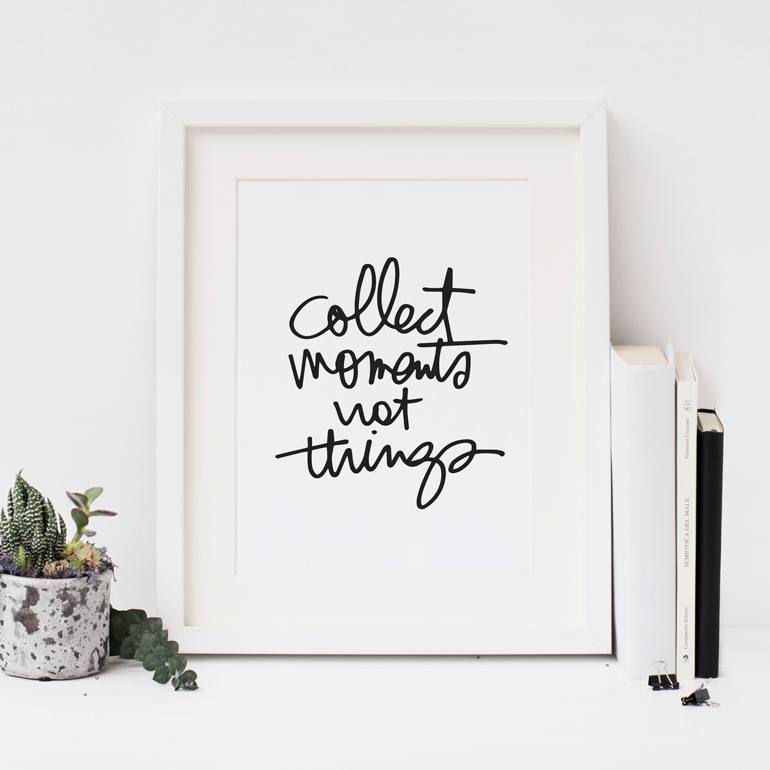 Paper + Lifestyle: Monthly Journal, prompt pages, calendar, t-shirt, decals, paper pads, etc. Checkout: Once you have added any items to your box a fifth tab will appear in red. You can click this to checkout or use the red button under your box in the top right corner. You will also be able to check out via the red box icon on the top right corner. You will be able to click on any product image and will be taken to a product page that includes a description and additional product details. You will also be able to add to your box from the main shopping page or from the individual product page. The above screen shot shows where your "OLW cart" is located while you are shopping the One Little Word® products. You will not be able to add products from my regular shop to this cart - it is a completely separate cart for One Little Word® during the Order Selection Period. After the Order Selection Period ends the products will move into the regular shop and regular shop shipping rates will apply. You can adjust the amount of the item you want to order or remove the item from your box (only before checking out) in this area. Please make sure to double-check your quantities before checking out. Once you have clicked "checkout" and gone through that process your products will then appear under the "My Box" tab. Above is a screenshot of the checkout page for desktop users. With our simplified shipping this year (flat rate $5 for domestic and $15 international) you will be charged this flat fee the first time you check out. After that it will note "PAID" in green for "Box Bundle Shipping" on any future checkouts. The Order Selection Period for One Little Word® will begin on Wednesday, November 28th at 9am Pacific end on December 14th, 2018. After the Order Selection Period closes we will box up your order and ship it to you in mid December. Once you have checked out you CAN NOT remove products from your box or edit your order. Customer Service will not be able to make adjustments to your order after you have checked out. Please verify the numbers of product placed beforechecking out - you will be able to see an adjust the quantity of an item before you check out via the box icon on the top right of your page. The project will always be more important than the products. The Box Shipping rates will be as follows: $5 Domestic Flat Rate and $15 International Flat Rate. This will be charged on your first "checkout" and that will be the only time you are charged shipping. After that if you checkout again under "Box Bundle Shipping" it will say "PAID." Custom acrylic words and necklaces are not part of the Order Selection Period and ship separately. Questions on all this? Some of you are veterans of this process and for others this might be completely new. Please let me know in the comments below if you have questions. Now let's move on to what we have available for you this year! 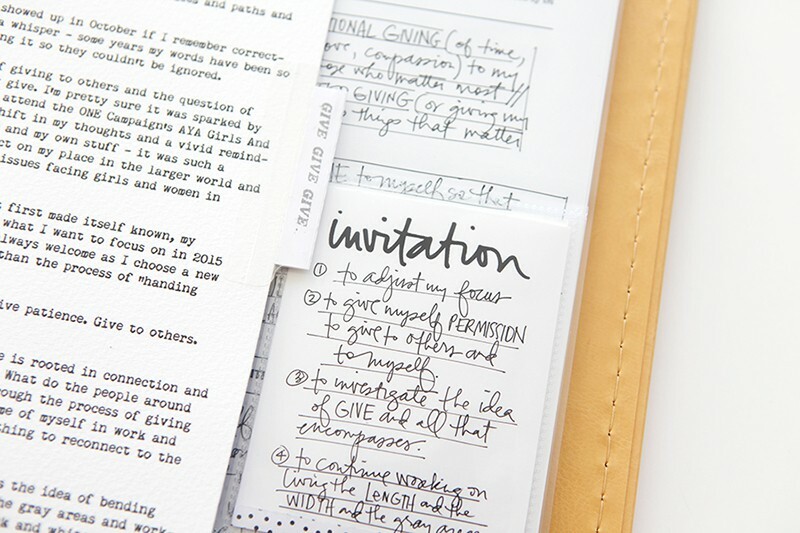 A few years ago we offered a small One Little Word® Journal with some additional suggestions of ways to connect with your word. 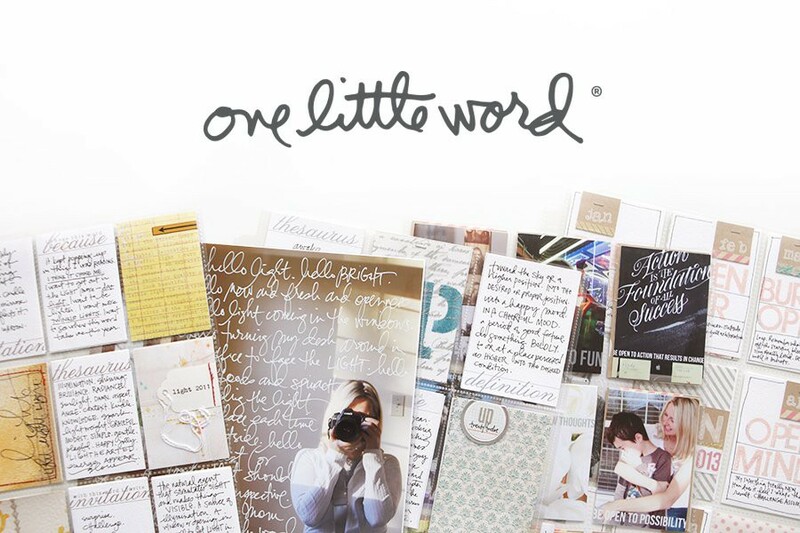 This year we invited our friend Liz Tamanaha of Paislee Press to design a One Little Word® Monthly Journal using a collection of my ideas from past One Little Word® projects. I totally love how this came together. Each month includes a calendar spread, a section for monthly goals/reflections, and then a prompt or two that is different from what we will be doing in the workshop. This journal can work on it's own or it can be a lovely companion to the work you are doing to connect with your word via the online workshop. My hope is that this journal can be a way to deepen your experience with your word and should be an awesome addition for those of you who are looking for more when it comes to connecting with your word. As in past years we are offering a One Little Word® Main Kit to help you make your word visible throughout the year. I will be using these products throughout the year in my album for the One Little Word® workshop. In addition to the Main Kit we are also offering 3 album options, transparency dividers in both 6x8 and 3x8 sizes, and prompt pages in both the 6x8 and 3x8 sizes. 2, 6x8 albums with 2.5 inch spines and 1, 3x8 linen album with a One Little Word® pattern on the inside. Transparencies include label stickers to customize the tabs. Each of the pages has either a grid pattern on the other side or a continuation of the prompt. From stamps to chipboard bundles to notepads to an inspirational wall calendar, we've got you covered with products to help you make your word visible in 2019. In addition to the Main Kit, albums, transparencies, prompt pages, and the Monthly Journal shown above we've got a fun collection of other items you might want to use to help you tell the story of your word in the coming year. Registration for my annual 12-month One Little Word® workshop will also open tomorrow, Wednesday, November 28th at 9am Pacific. Register before December 31, 2017 to receive the early-bird price of $26 (after December 31st the price is $31). 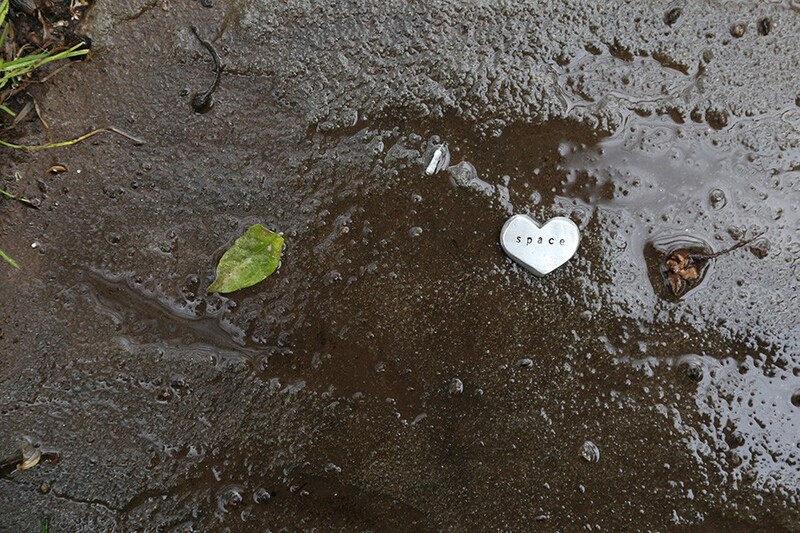 The workshop will operate much like it has for the past eight years (started in 2011) - monthly creative prompts to encourage you to connect with your word via writing, photography, and collage. This year I'll be working in the 6x8 format. Past students have reported learning about celebrating progress rather than perfection, about the power of focusing on a single word and the impact that can have in your life, about how many little moments make up the patterns of our lives, about thinking of your future self as you make decisions today, about how your own journey is important, about how to step back into the story of your own life as an active participant, about learning what you most need from yourself, and about the power of coming back again and again to your original intentions as a means of reflection and forward movement. In addition this year we are offering a gifting option if you would like to give the gift of this workshop. On the workshop shop page you'll find a link to "Gift This Class" under the orange "Add To Cart" button. After clicking through to purchase you will receive an email with a PDF that includes a one-time use code and link for your recipient to gain access to the classroom. Giving the gift of education is fun and meaningful and lasts all throughout the year. As an enrollment bonus we will be including the One Little Word® Digital Main Kit + Prompt Pages with your workshop purchase ( details about the physical kit can be found above). Just a heads up that this digital kit includes PNG files, not PDF files. This kit will be available to you in the classroom before the end of December. New to the box system...so if I add the main kit and check out...I can still go back and add additional items to my box that will all ship together for that same $5 fee?? Will the kit be available after the order selection ends and added to the main shop? For internationals, $15 shipping is half the price of the main kit (though I do understand it is flat rate so I could add more, but trying to be the boss of my supplies) which feels a little tricky to manage with a tight budget. My guess is that it will still be available. Question about the Journal, the monthly prompts in here are different than the workshop monthly prompts? this is in addition to the work we will be doing in the workshop? or is it a mirror of the prompt from the workshop. thanks for clarifying. Yes, the class will be different (there are a few things that are similar - the "vision board" at the beginning of the journal - but even that is not the same as the workshop. Is it bad that I don't do One Little Word but I still buy the products and use them for other story telling stuff? Do I need that 3x8 album? Probably not but that bad boy is going straight into my cart tomorrow along with a few other things. Ha! Ali on a tight budget -- will the journal be able to be a Stand Alone without taking the class/workshop? How much is the Journal? The journal is $29.99. It's not going to be part of the workshop - more of a supplement for those who want more or for those who might want something different from the workshop. Will the stamps and other embellishment type things be available digitally to purchase? They will be available digitally at the beginning of January. Are there a limited number of products, like a first come first served kind of thing? 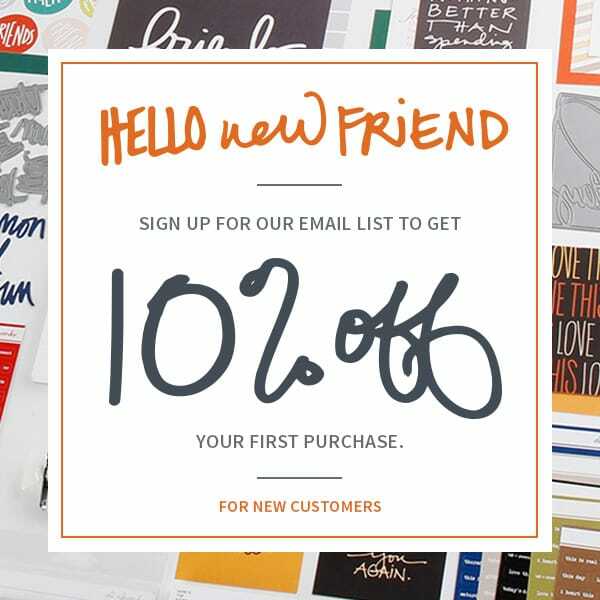 I know your products tend to sell out quickly, they are super fantastic, so I want to make sure I can at least try to check in at 9 if I need to. Thanks. There is always a limited number, but we have increased quantities from past years. This project doesn't generally sell out as fast as December Daily® but I would still recommend purchasing early in the process if possible. Wow! What a great selection of items. Loving the colorful chipboard. Is there a price list so I can plan what to get. I'm trying to stay within my budget? Thanks. Ali, what size is the journal? It's about 6.5 x 9. I don't even have a word yet but I'm going to have to come up with something because I NEED that journal! I'm so excited to see some SILVER in the foil designs! I am not a "gold" person and the touch of silver looks so pretty! Will the journal be available digitally? I'd love to take advantage of the extra prompts in it, but incorporate it into my existing planner. Hi! It will not be available digitally. Please add that beautiful aqua mint album (blank cover) to your regular inventory. I love colors! Yes, please!! That color is PERFECTION! Please - I want to use it as my regular PL Album for 2019. So many great product in lovely neutral colours, perfect! The only thing I miss, is a 6x8 album with the smaller spine. The teal one would be my dream, as I chose the logo ones every year, but I don't like the big spine in this project. Is there a chance, that the teal one would come with the small spine? Hi - not this year. Is there a chance that the Messy Circles 4x6 stamp set will be available again? I have the digital version but would really like the actual set. thanks. oh and 2019 products look amazing! Can you please post a price list tonight so that I know what to expect in the morning? Or at least the Main Kit, Class, Albums, 6x8 cards, and Dividers? Hi! We weren't able to supply a price list in advance of this release like we did we December Daily® but I will try to make that happen in the future. Searching for a price list...can anyone help? I love the idea of the OLW Journal. I noticed that it seems to be printed in grey tones, with the quotes in black. For those of us with vision issues, can we get a PDF in B&W so we can read it or print it in a larger size? I have the same challenge with the class PDFs that are typically printed in grey ink. I have to make a screen shot so I can rework the contrast. Or I enlarge the view in order to read it on the screen. Thanks for your consideration! Thanks for bringing that up! I will try to keep that in mind for future products. Will there be a digital version of the Journal? I love it, but would rather work on loose pages, than in a spiral notebook. Thank you! PS... it's all so beautiful. Hi - we will not be offering a digital journal. Awesome release.... OH THE STAMPS!!!! Love the Main Kit too! Thanks so much for the preview videos. I really appreciated being able to see everything in detail and then quickly making my selections once the shop was open. Looking forward to my 6th year with OLW...this class has truly changed my life! You are welcome! Thank you for being part of the community. Hi Ali! I filled a box and checked out! Yay! However, the class itself was not able to be ordered with the box, I don't think, anyway. Do you want us to buy that separately or add it to our box somehow? Hi! It's a separate purchase ;). Earlier today I put the embellishment pack in my box. Looking at my box now that item has disappeared and on top of it, sold out. Why didn't this item stay in my box? Secondly, will you get more in? You need to "Check out" each time you add products to your box to secure them. You are only charged shipping the first time. The only embellishment that sold out so far was something that we offered last year - it's not likely we will manufacture more of that one. It doesn't look like we can add the shirt to the box...is this going to be made available before the 14th?